Saigon Railway Station is the busiest train station in Vietnam serving passengers travelling from Ho Chi Minh City, which is Vietnam’s most populous city (estimated at 8.4 million) and the economic centre of the country. Saigon Railway Station is located at the southern end of Vietnam’s North-South Railway Line, also known as the ‘Reunification Line, which runs 1,726 km northwards to Hanoi, which is the capital city of Vietnam. Saigon Railway Station is relatively new, having been constructed in 1983. The current Saigon Railway Station is the third in line of different main stations in Saigon. The first Saigon Railway Station was opened in 1885 and was located near the river on what is now the Hàm Nghi Boulevard. Following the construction of the Saigon to Nha Trang stretch of the North-South Railway Line, a second Saigon Railway Station was opened in 1915 near Bến Thành Market on the Phạm Ngũ Lão Road. The railway line connecting this second Saigon Railway Station has been removed but the station building still stands, renamed (23-9 Park) and re-purposed. The third and current Saigon Railway Station is a more modern design with few train platforms, and an electronic gate system restricting access to those platforms. The design of the station facilitates a passenger management system where the travelling public waits within the station building until only a few minutes until a train is due to depart and passengers pass through the electronic gates straight into their train carriage with as little time as possible spent track side. 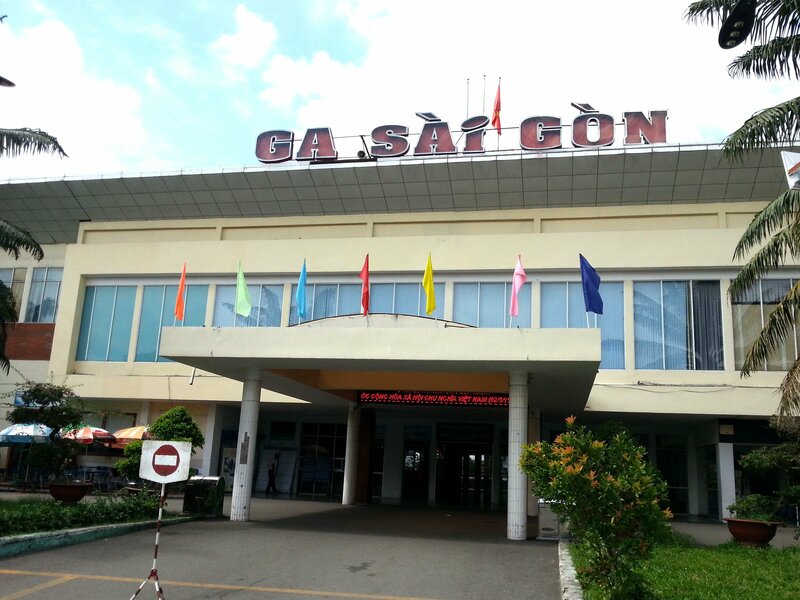 Saigon Railway Station is located some distance from Ho Chi Minh City Centre and at the far end of a large car park. There are few shops and restaurants within easy walking. 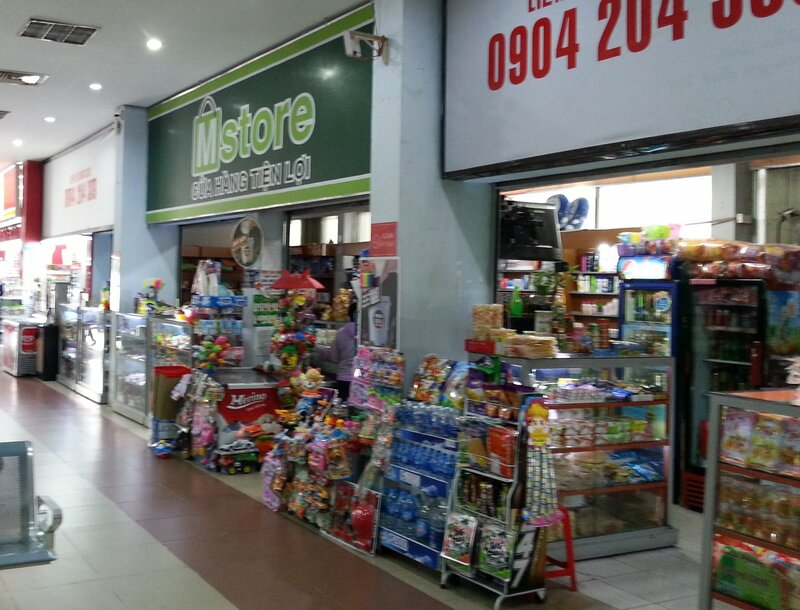 Fortunately, Saigon Railway Station has several convenience stores and a fairly large and inexpensive restaurant. There are also free (and well maintained) toilet at the far end of the main waiting area. If you arrive for one of the earlier departures the restaurant and the shops will still be closed, although there is an outdoor restaurant at the side entrance of the station which sells coffee, snack food, drinks, and cigarettes at slightly expensive prices. Passengers on a tight budget with an early departure may benefit from buying drinks and snacks etc at another outlet and taking them to the train station. 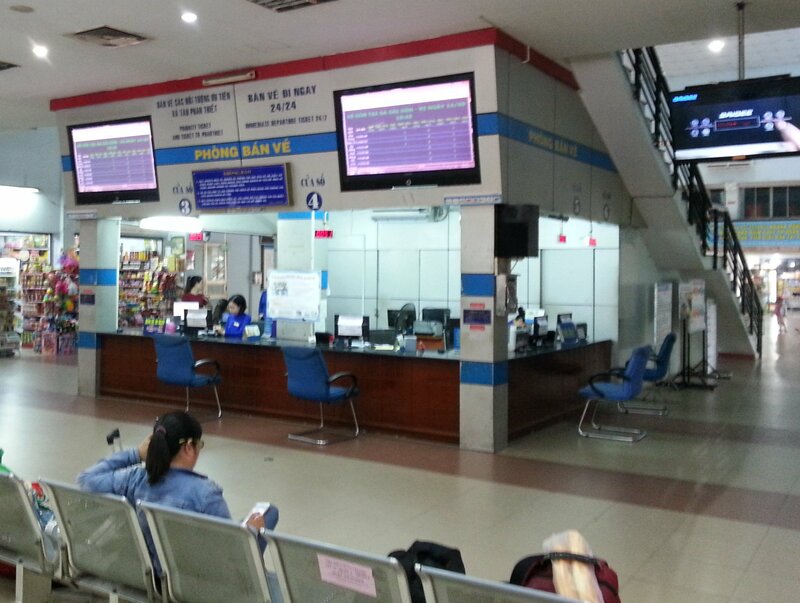 Saigon Railway Station offers free WiFi to passengers waiting for a train. To log on go find the connection entitled ‘Railways Free Wi-Fi’ and use your browser to access the ‘Log On’ page. You will asked for some information about yourself and your journey, and thereafter you will have access to the internet. 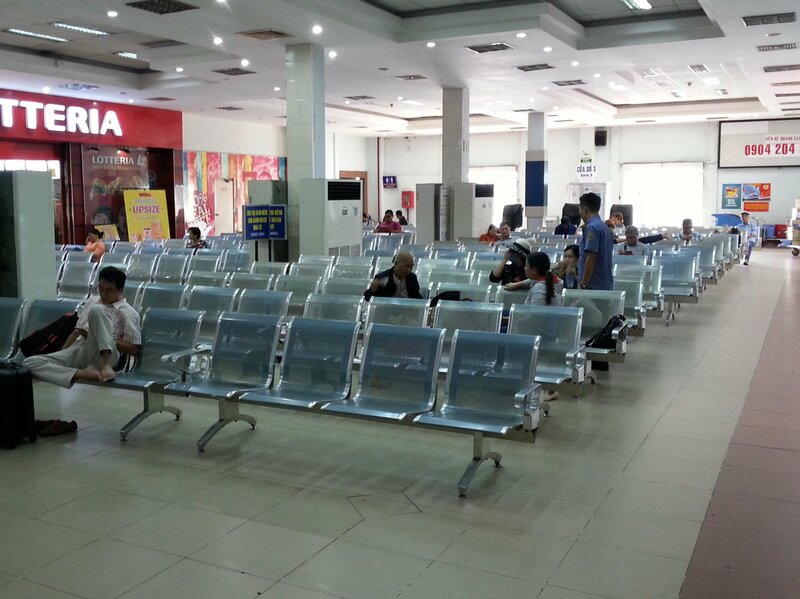 The ticket counter is located on the ground floor of the train station in front of the main waiting area. Buying tickets at the train station is easy. The counter staff at Saigon Railway Station speak English and accept US Dollar as well as VND. The range of seats you will offered, however, is limited to seat or sleeper, hard or soft. If you want to book one of the more comfortable carriages then you are better off booking online (see below) or through an agency. For destinations other than Hanoi click into the box and type in the first few letters of your desired destination. This will activate a drop down list from which to select your destination. After clicking to Find Tickets you will be given a choice of the full range seat types available, rather than the choice of ‘hard’ or ‘soft’ they offer at the ticket counter. 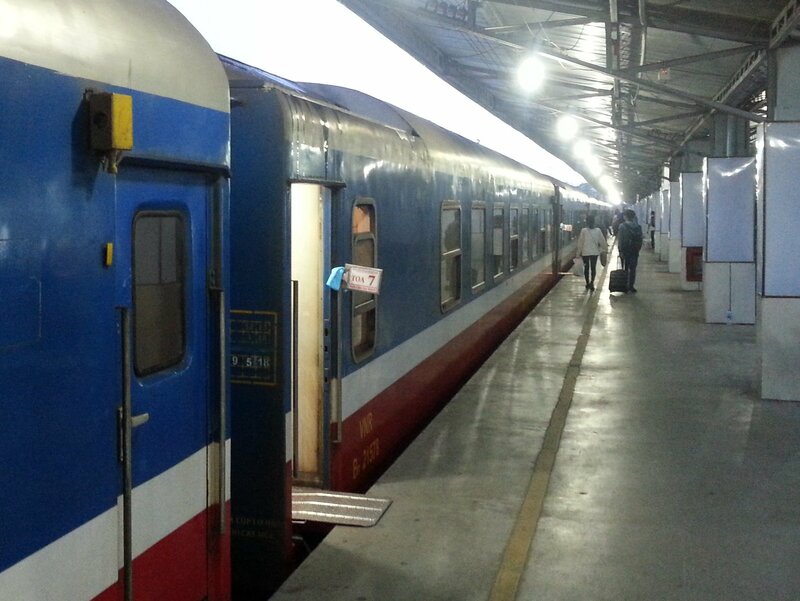 There are 4 daily train services from Saigon to Hanoi. Buy train tickets from Saigon to Hanoi. There are 11 daily train services from Saigon to Nha Trang. Buy train tickets from Saigon to Nha Trang. There are 4 daily train services from Saigon to Da Nang. Buy train tickets from Saigon to Da Nang. There are 6 daily train services from Saigon to Hue. Buy train tickets from Saigon to Hue.